After a very hot end-of-July I’m writing this while enjoying a cloudy, 68-degree afternoon where it doesn’t feel like being in a convection oven outside. Yay! My constitution isn’t designed for heat — I get grouchy and easily overwhelmed — and am happiest when we don’t get over 85. When it’s too hot we close up the house and turn the A/C on, and I feel disconnected from the season just looking at it from behind glass. This (above) is the view outside one of our basement windows. It’s against the fence on the north side of our property, and in the additional shade of a Trachycarpus fortunei. This is the second season these plants have been in the ground after the basement project, and I look forward to the Athyrium taking on a bit more size. 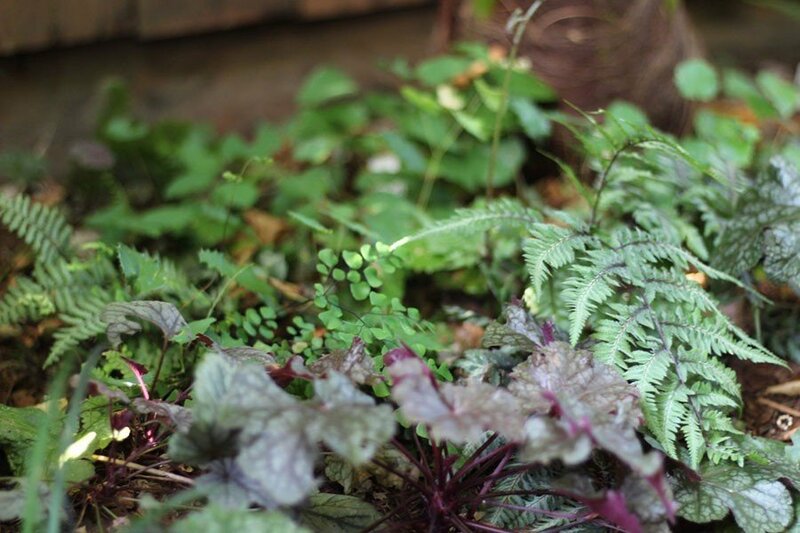 It’s a blend of Epimedium, Heuchera, Athyrium, and Adiantum venustum. I do love a Hydrangea quercifolia — not only for their flowers that start out white and fade to pinks and taupes, but also for their amazing fall foliage color. 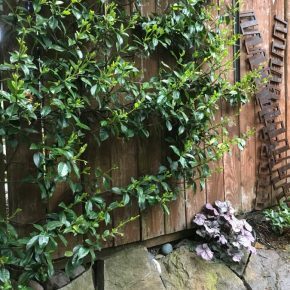 Looking into the northeast corner of our property, I’m considering that I might like to add some more Persicaria to the garden next year. Maybe Golden Arrow to complement the nearby glaucous foliage? This Cup & Saucer Vine (Cobaea scandens) has yet to produce a flower, but it is growing like crazy. Here it’s nestled up to the leaf of an Amaryllis I’m attempting to keep around until the holidays — the Amaryllis is on the railing of our deck outside the back door so I’m afraid there’s no where else for this vine to go vertically beyond this point. Time for a trim. 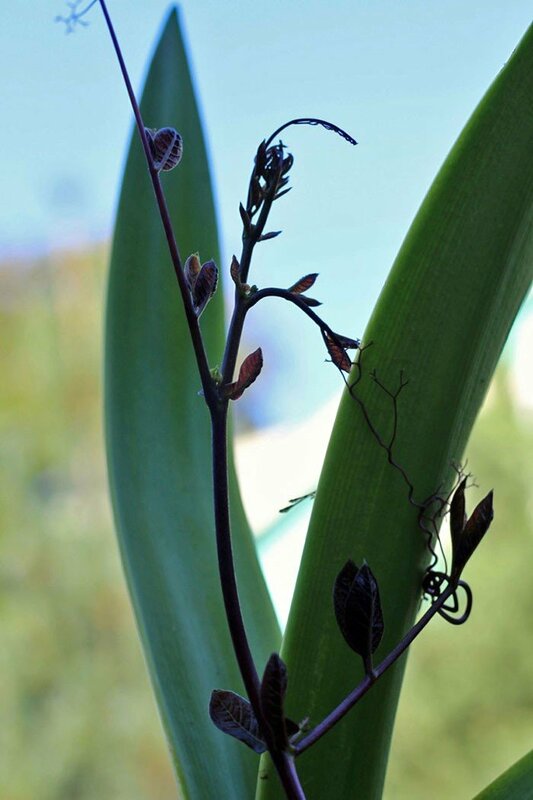 I finally remembered to get my lily stakes in the ground just as they started to grow in the spring, but a couple of stems were too tall and toppled over. I brought them inside and placed them on the dining room table where they’ve been perfuming the house for days. 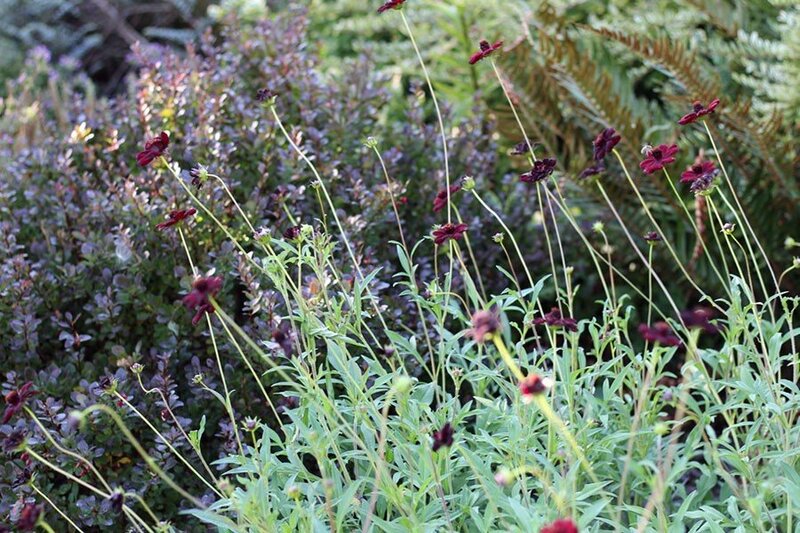 The Chocolate Cosmos (Cosmos atrosanguineus) is such a great plant and I don’t like to be without it. 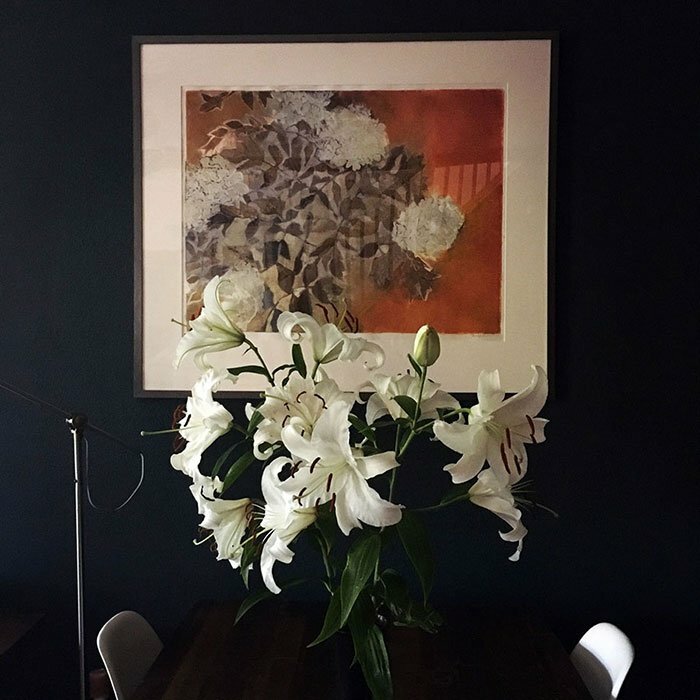 It’s covered in blooms and they’re being added to every flower arrangement I make these days. 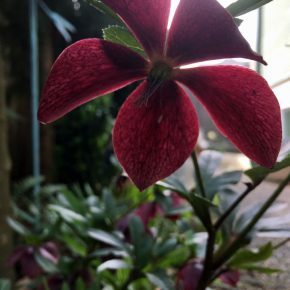 I love to share them with people who aren’t familiar with them who can’t get over their scent. 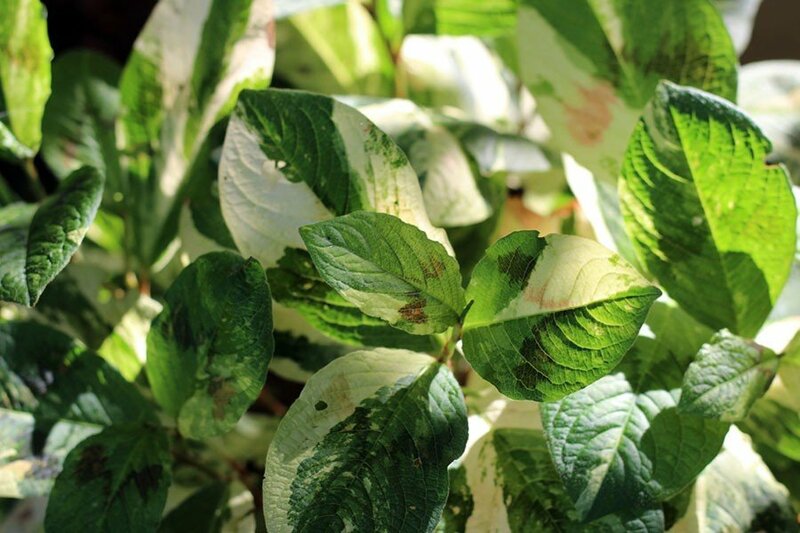 The Persicaria ‘Painters Palette’ is positioned so that it’s backlit by the evening sun making the whole plant glow. 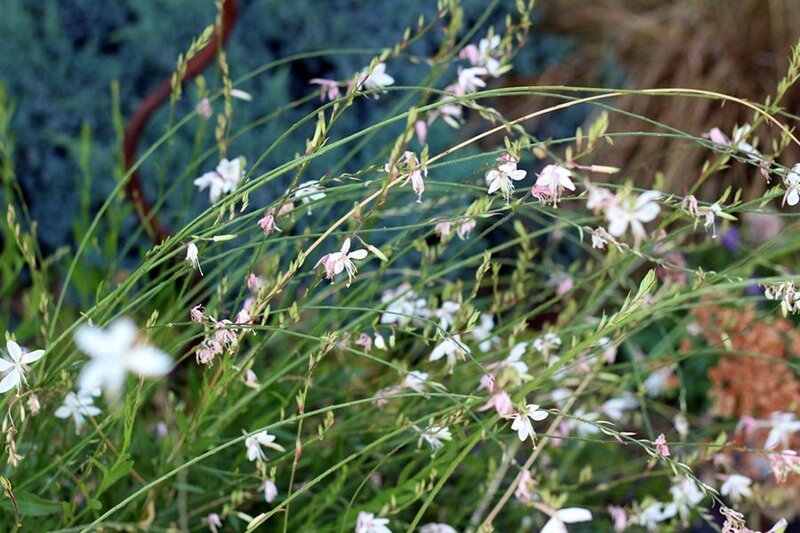 I love this Gaura ‘Whirling Butterflies’, and the bees do too. Watching the bumbles trying to land on one of the swaying flowers is a treat. And the ground covers are working extra hard to shade the soil these days and keep the moisture in when I add it via the hose. 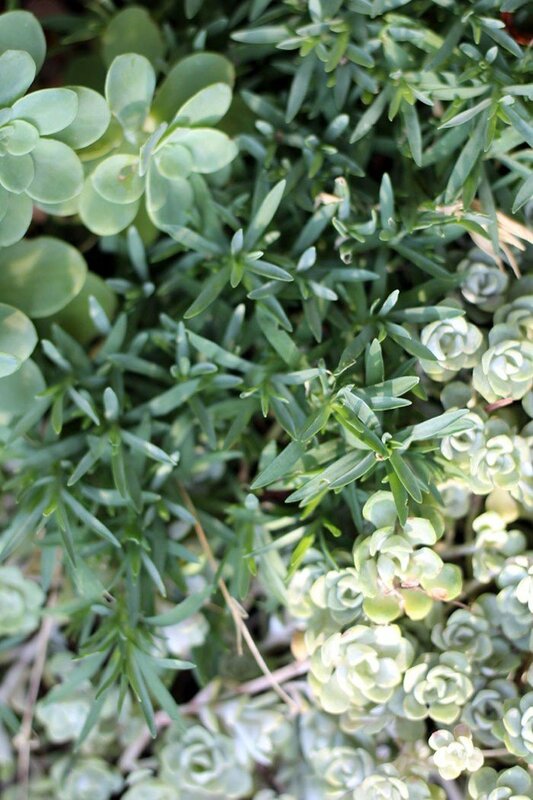 Here we’ve got Sedum palmeri, Dianthus ‘Tiny Rubies’, and Sedum ‘Cape Blanco’. This Wisteria ‘Amethyst Falls’ is having a second flush of bloom right now — it’s native to the USA and grows about 1/3 as vigorously as its Asian cousins, often flowering much sooner. 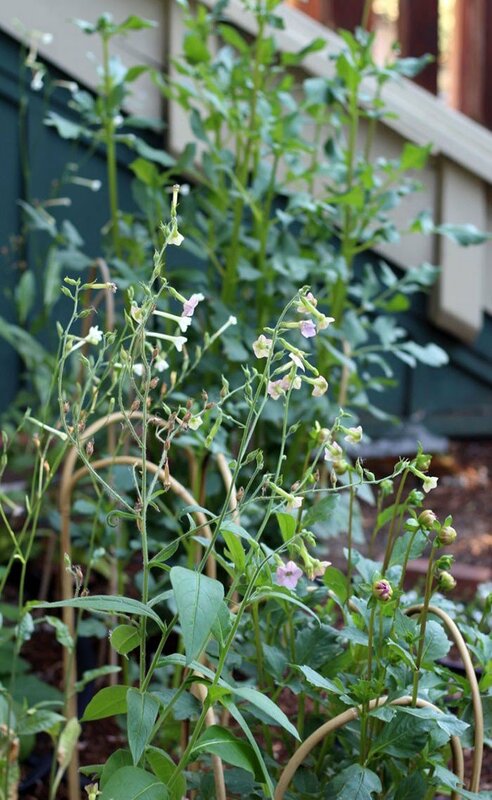 In the front of the house I have a bed temporarily planted with Dahlias and Nicotiana, both for the evening scent (Nicotiana) and to create flower arrangements (Dahlias). This space gets some pretty hot sun, but there’s a soaker hose on a timer over there that is really helping to keep things happy. 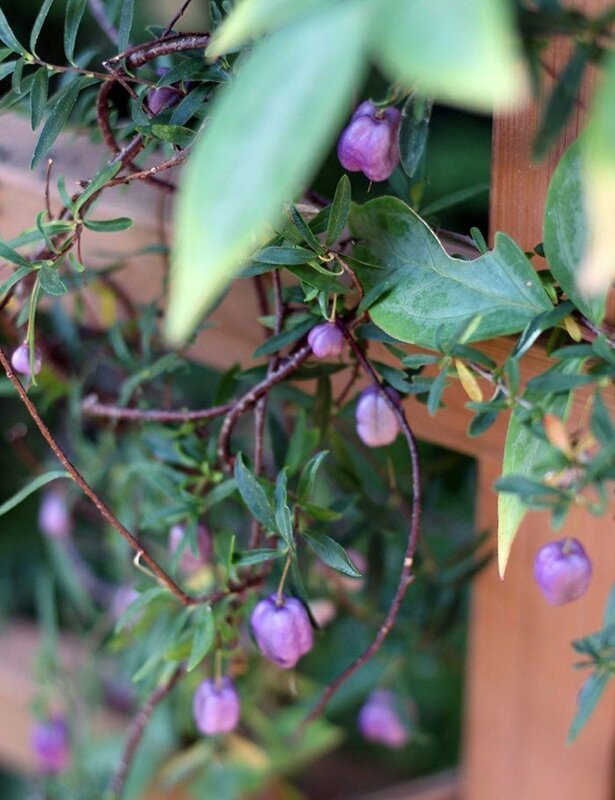 This Billardiera longifolia is sharing this part of the arbor with a winter-blooming Clematis. I love how its fruits look like little, purple elongated pumpkins. 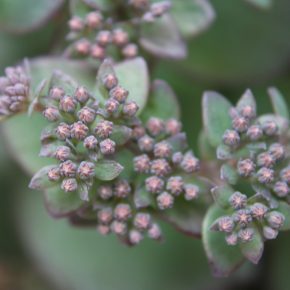 This sedum is new to me: Sedum ‘Touchdown Teak’. 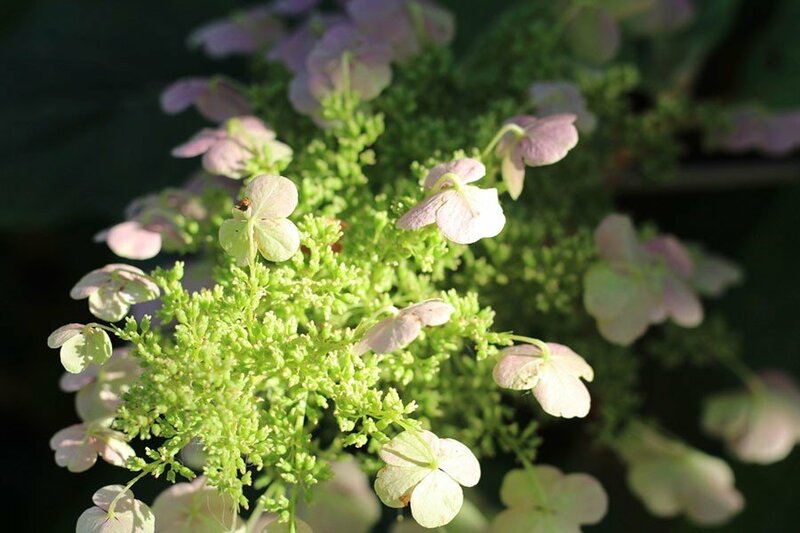 It has a really upright growth habit, and a beautiful color, and I look forward to spreading it around a bit next year. 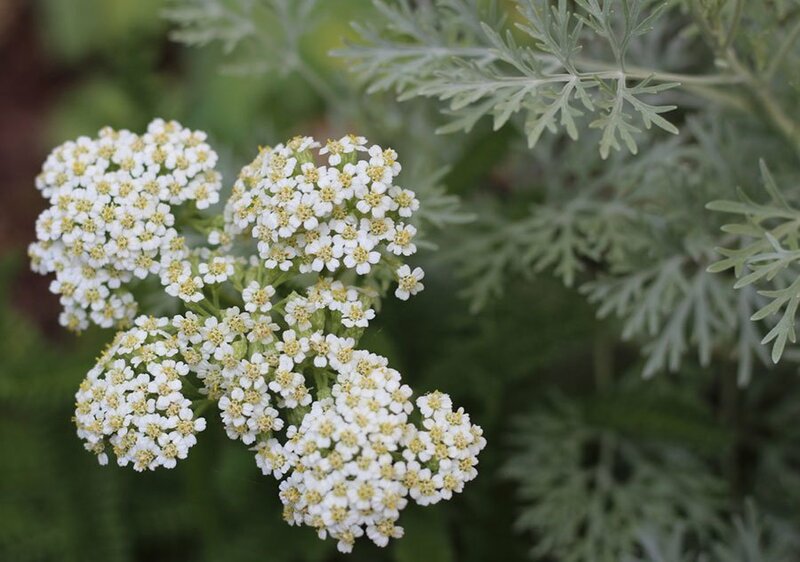 So far this is the only bloom on my Achillea millefolium ‘Sonoma Coast’, which is from Annie’s Annuals. It has a low & tidy growing habit that I’m really enjoying. 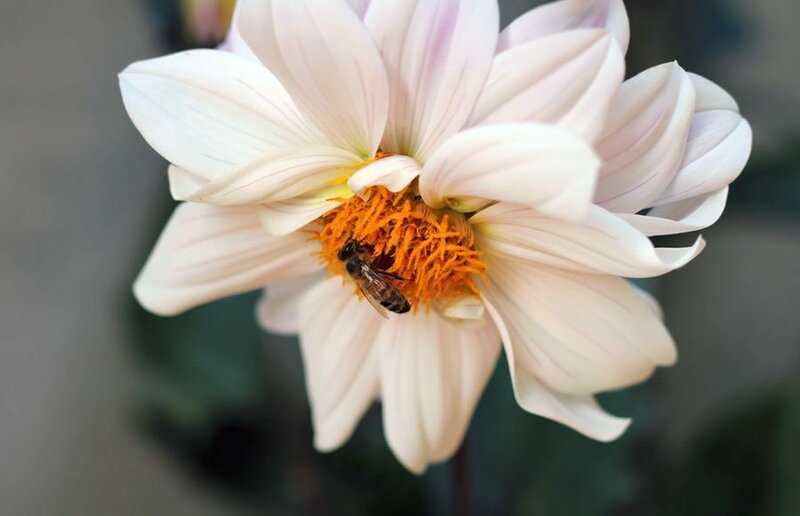 This little bee is enjoying the pollen on our massive white-flowered dahlia, which benefits from the warm exhaust from our water heater. 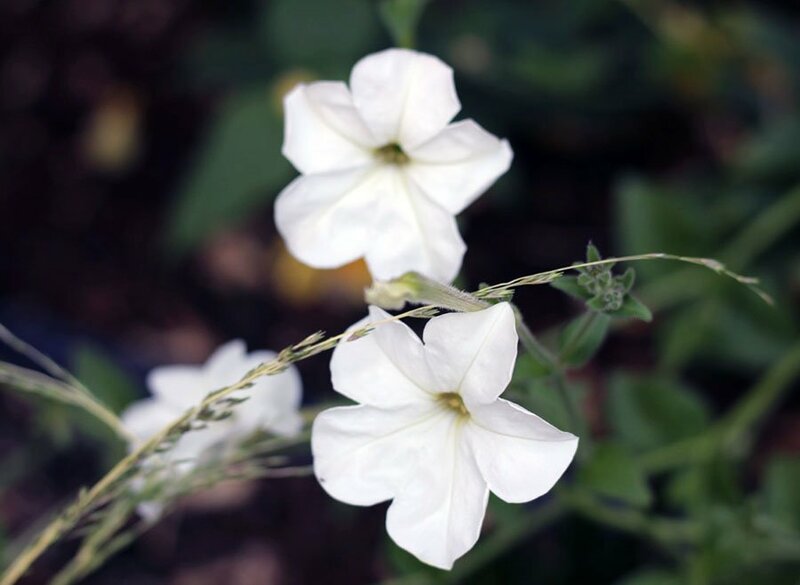 This Petunia axillaris has an incredible fragrance (evenings especially) and is the ancestor of modern Petunias. 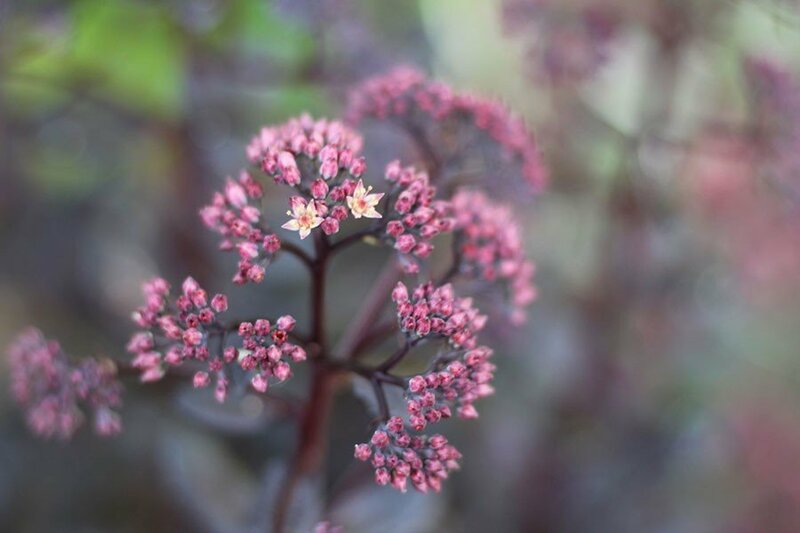 It’s perennial in Zone 9 and tucked into a protected spot in our garden — will it overwinter? Only time will tell. 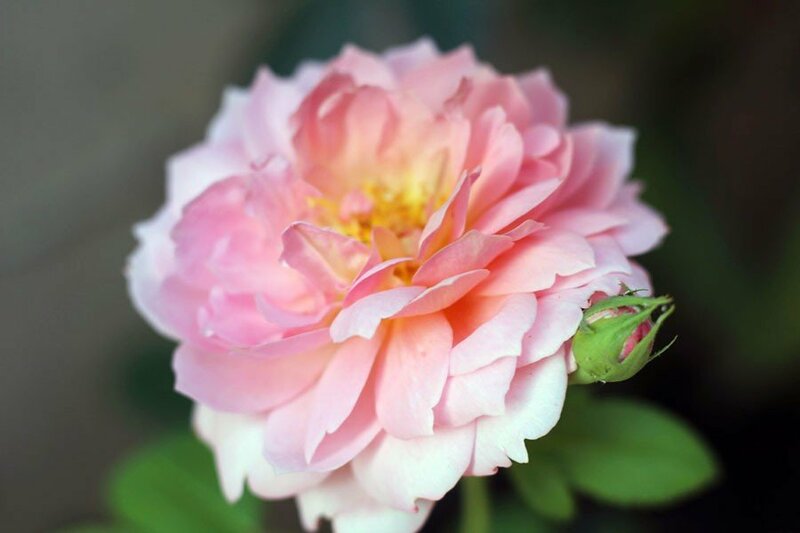 This is the much anticipated bloom of the David Austin rose, ‘Carding Mill’, which they promised would smell of myrrh. I haven’t smelled much myrrh in my time, but it does smell lovely. 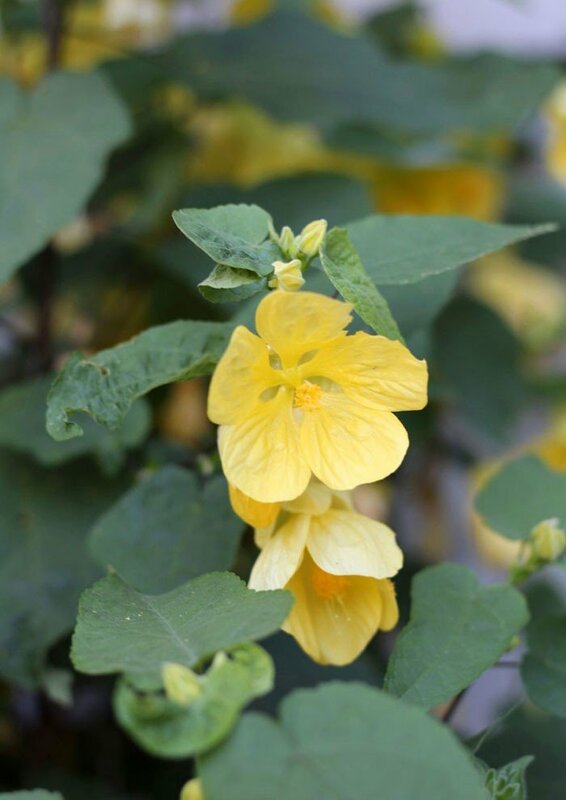 This Abutilon ‘Lucky Lantern Yellow’ isn’t my favorite right now. It’s a bit one-note for me and I’m considering whether I keep it or give it away this autumn. I love these flowers! 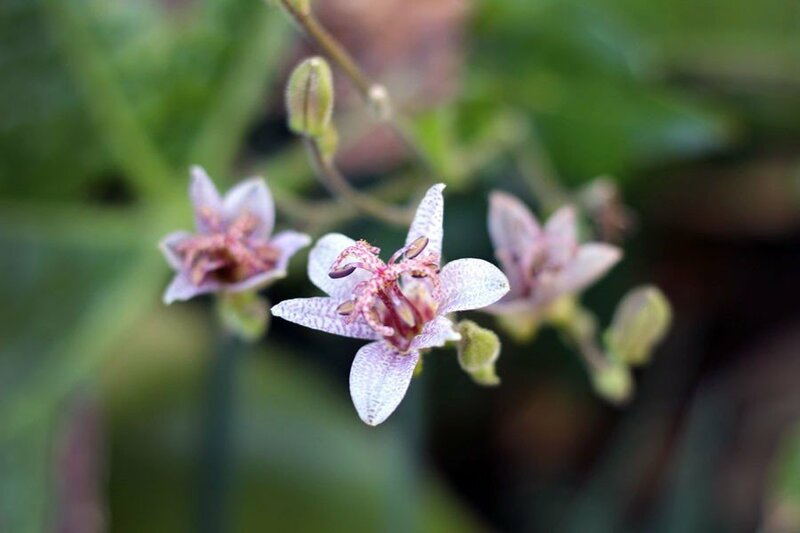 Tricyrtis (aka Toad Lily) is so unassuming until these blooms appear then it just knocks you out with their delicate complexity. 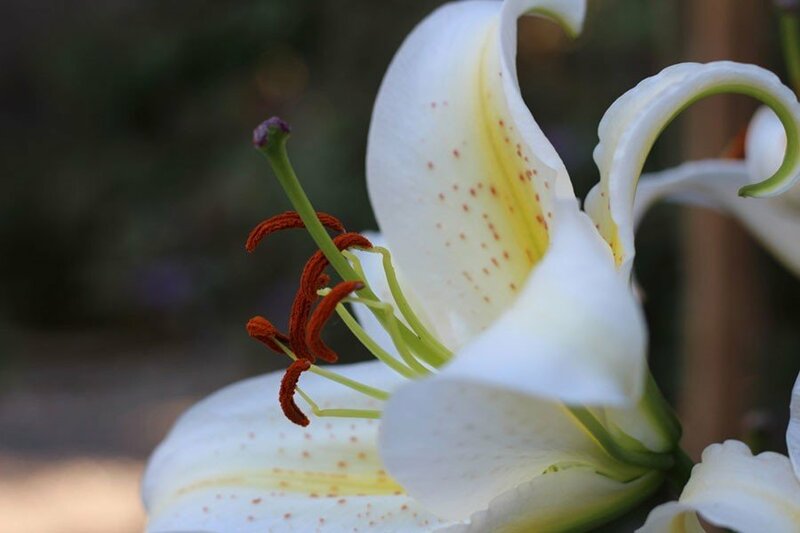 Scent is important to me in the garden, and these lilies have perfumed the whole back yard delightfully. I recently discovered these antique ceramic marbles. I love how inconsistently sized and shaped they are, and the variations on the color of the clay. 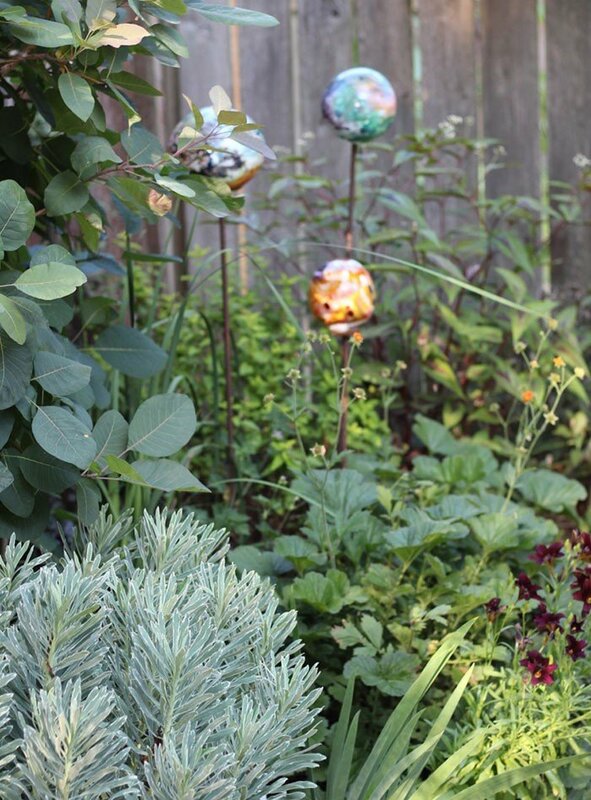 I’ve decided to fill this little stone pocket with a whole collection of them, and my husband recently came inside to say, “there are these huge, weird round eggs in the garden outside!” It wasn’t until he showed me that I put two and two together. The hips on Rosa glauca are just outstanding. 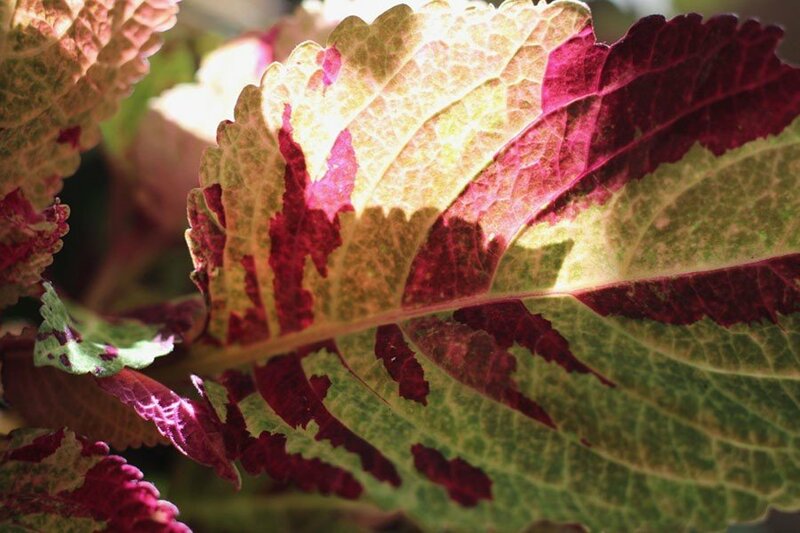 Coleus back lit by the evening sun. 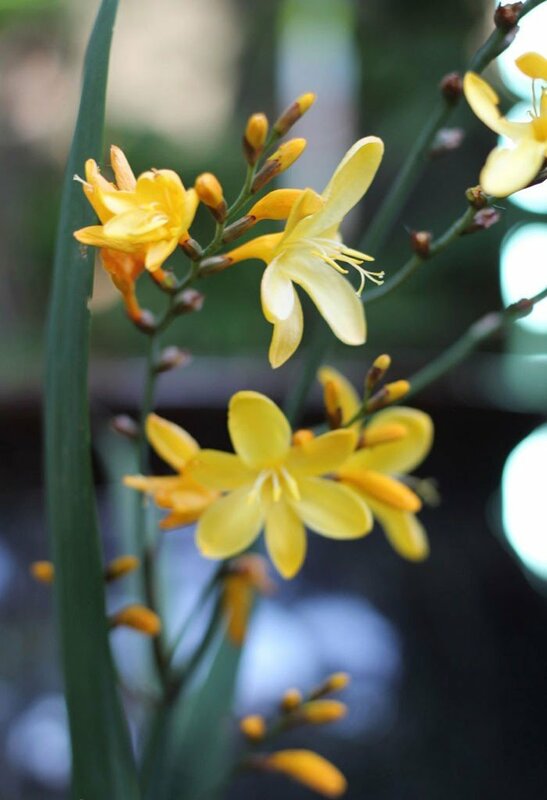 The blooms of Crocosmia ‘Solfaterre’ are everything I’d hoped they’d be. 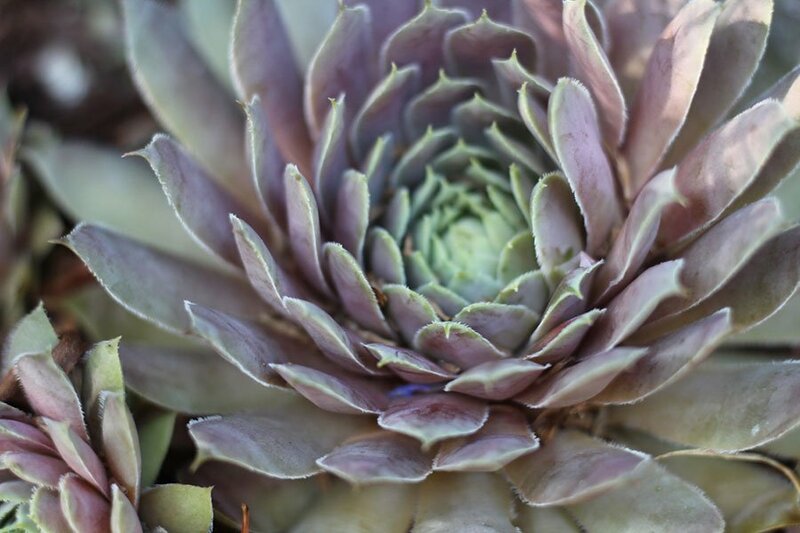 The lavender of this Sempervivum is so beautiful, and I love that the color has stuck around through the summer. 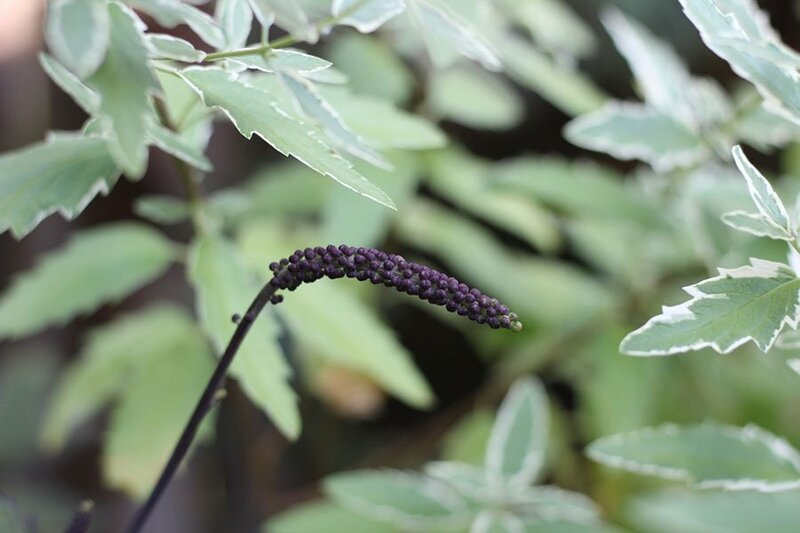 Before the Actaea simplex flowers open, they look like little purple quinoa attached to the stem. 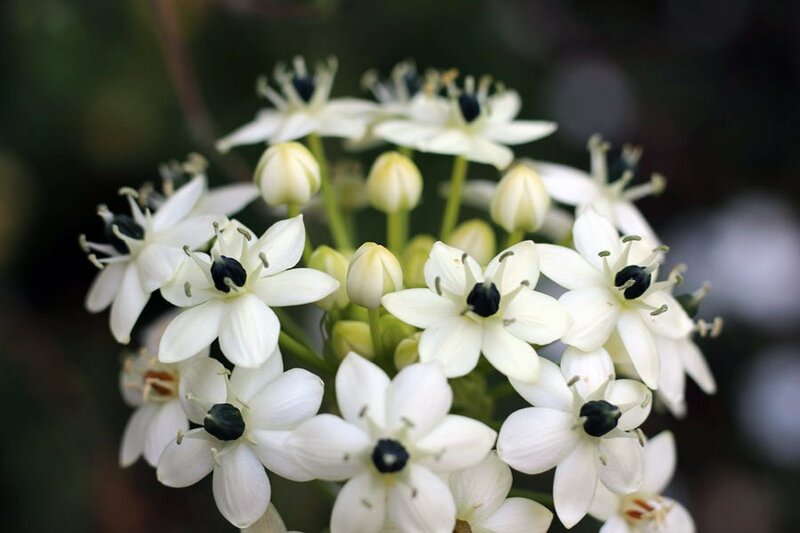 I’m enjoying the single bloom on the Ornithogalum saundersiae (aka: Star of Bethlehem or Summer Starburst or Giant Chincherinchee or Ivory Coast Lily). I planted a handful of bulbs, but only one bloomed, so I’ll lift them this autumn and try again next year. And finally, I share this mushroom because it marks the spot where there was once a lovely variegated Acanthus (aka: Bear’s Breeches). 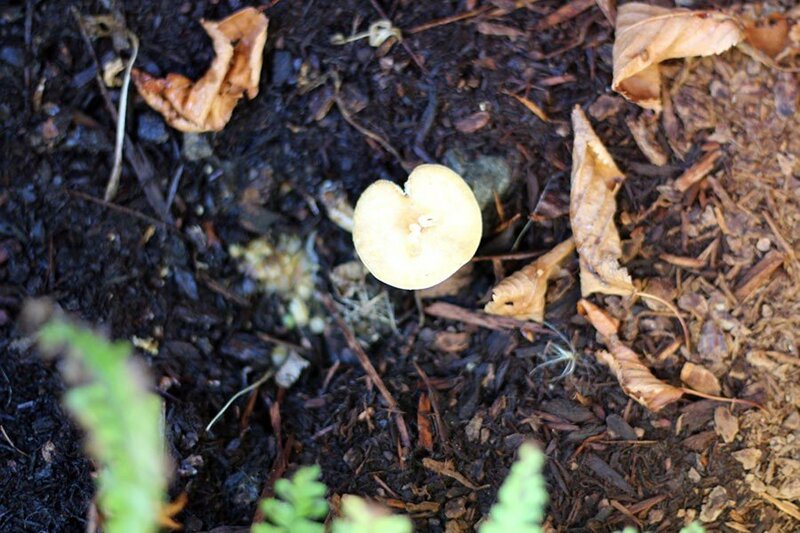 You can actually see the blurry remains of the stems just to the left of the mushroom. Something obviously thought they were SUPER tasty because they disappeared in only a few days. This is my second attempt to grow this plant, and will likely be my last. 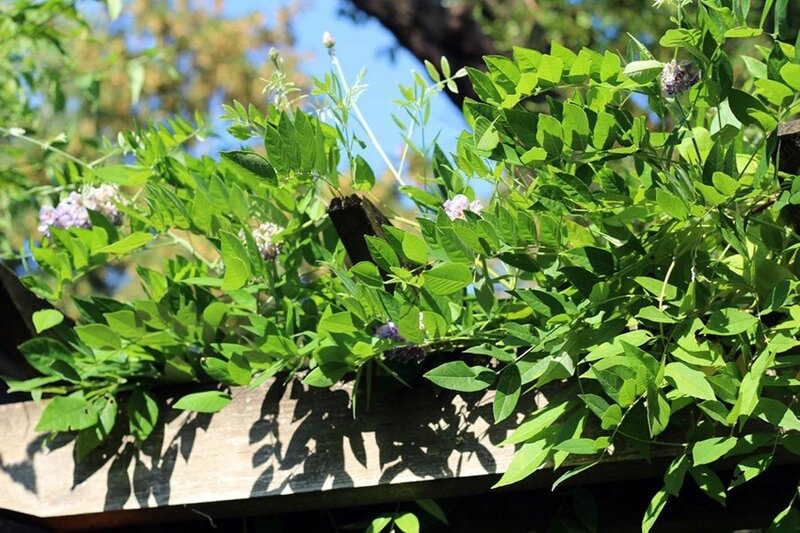 Some plants just aren’t meant for your garden, you know? Beautiful! 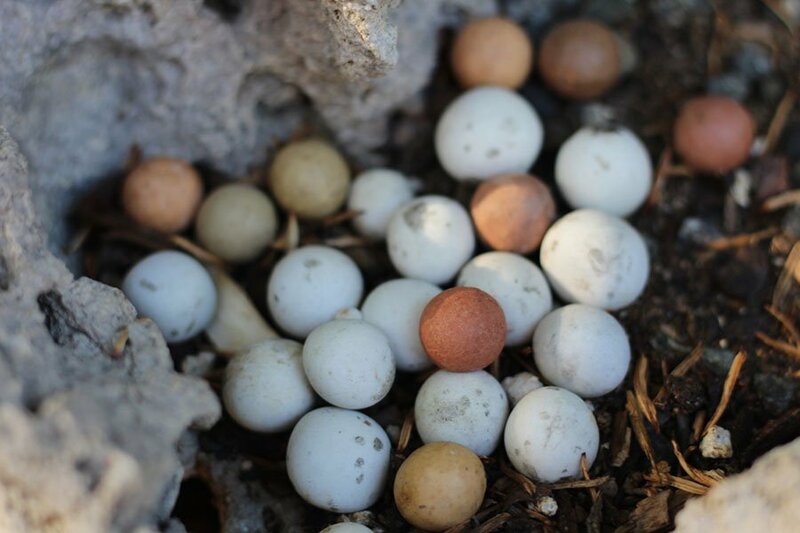 I thought the marbles were bird’s eggs at first. 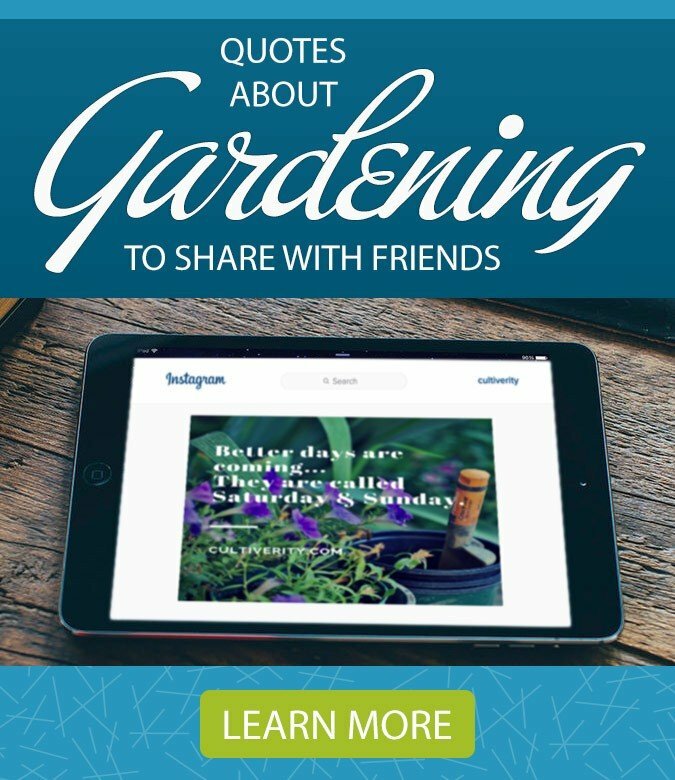 You have so many great flowers! You & Graeme are 100% right that if you don’t know what those marbles are, they totally look like eggs. It’s funny you say that I have so many great flowers (and thank you!) 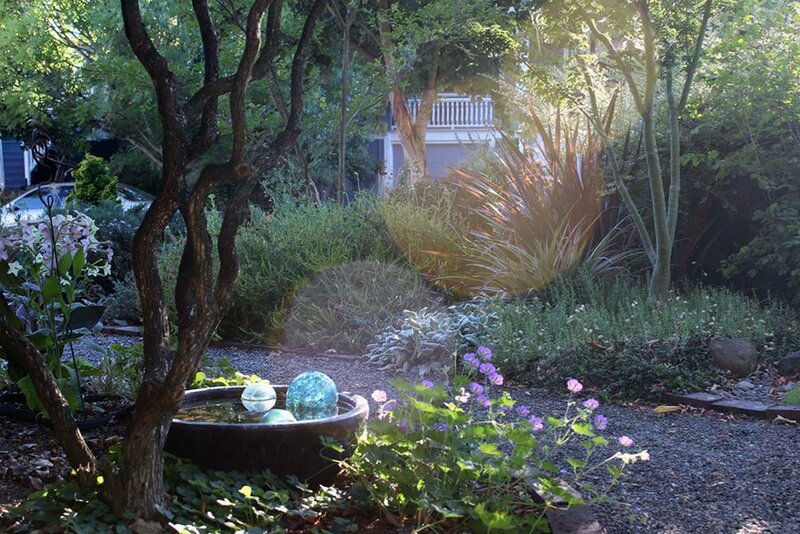 because I think of my garden as a primarily foliage-driven affair. I maybe wrong! Ha! 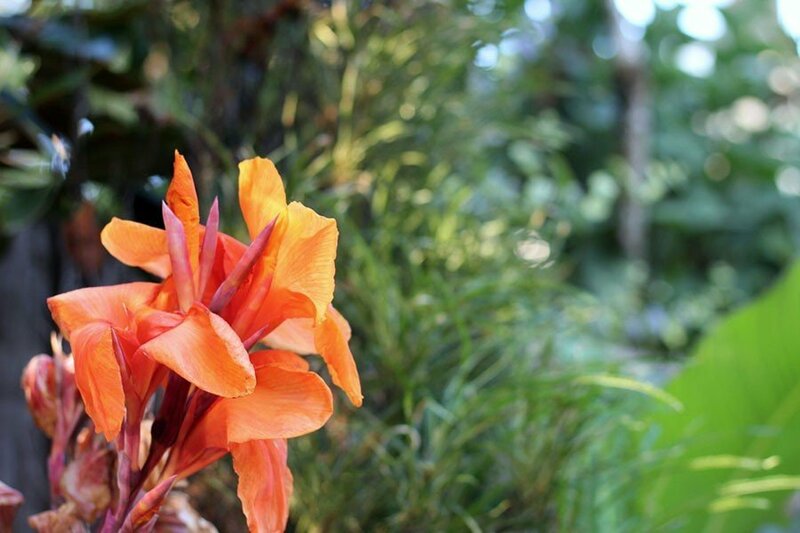 Your garden is full of beauty! The only time I grew Cobaea scandens I ended up with a lovely foliage show, but not a single flower. Boo! 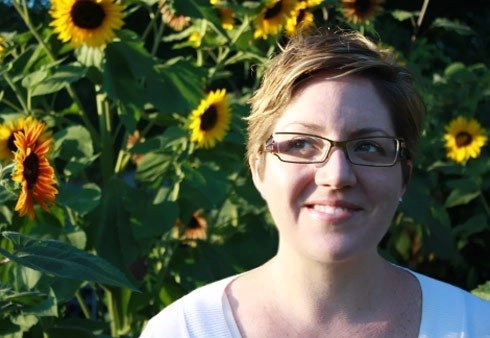 I love your antique marble eggs and the story to go with. 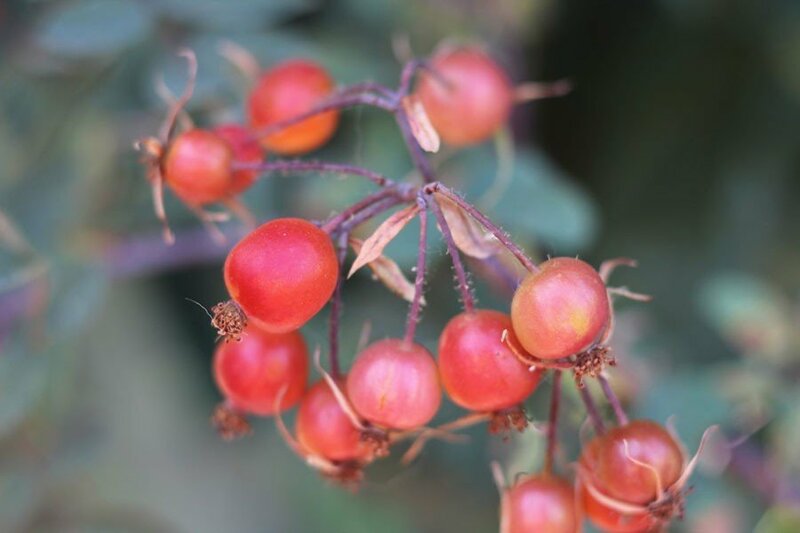 And those Rosa glauca hips. I swoon!